Hi my name is Christina and I love card making. 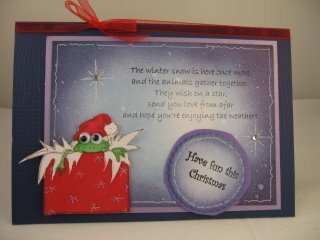 These cards are just a few of the ones I have made to send to family and friends this Christmas. I have used a variety of techniques from stamping, and then colouring in the image, to digital papers printed from an ordinary printer and a purchased CD. 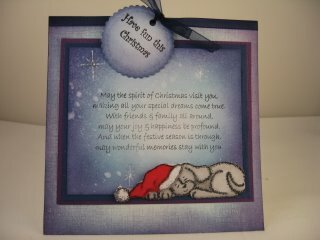 Adding glitter and some gemstones can make all the difference to your cards and at this time of the year just about anything goes. Raid your stash box and see what embellishments you have hidden away in there. You may come across something you had completly forgotten about. I know I do because as a true "Crafter" I throw nothing away. 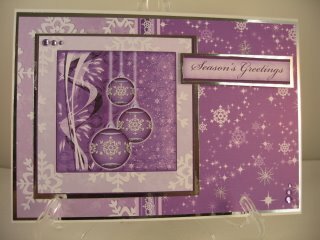 I save buttons, bows, ribbons, lace...in fact anything that can be stuck, with some strong glue, to the front of a card. I hope you will come and visit me and see what there is for you to try. 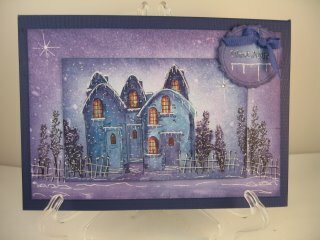 There are lots of easy projects and videos with step by step instructions that will take you to the finished card.